Boruto, Sarada, and Mitsuki have come together and formed ‘Team 7’. The three, led by Jonin Sarutobi Konohamaru, have received their first mission. The mission details the repelling of bandits who have been attacking a village, and making it so that they never come back again. 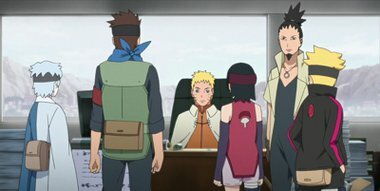 Boruto and the others immediately depart for the village, and come face-to-face with a young woman named Kiri, who is the daughter of the village chief who had suddenly passed away and has inherited her father’s role, and the others who support her.